Palletizing Systems – Möllers North America, Inc. Many facilities are turning to automated and semi-automatic palletizing systems since individual packaged units can be heavy, awkward, and physically strenuous to handle manually, thus reducing potential worker injuries. Products that palletizing systems are typically used to handle include bundles, trays, drums, cases, pails, barrels, totes, bags and sheets. Often, palletizing systems are designed to handle a single type of product. Such systems include bag palletizers, case palletizers, drum palletizers and bottle palletizers. They can also be designed to handle several different types of packages. The material handling applications that palletizing systems are most often used for include shipping, warehousing, packaging and distributing in both manufacturing production lines and order fulfillment operations. Generally appealing to users with mid to high-range needs, palletizing systems benefit industries including pharmaceutical, food processing, warehousing, agricultural, commercial, electronics and medical. Able to be pneumatically, hydraulically or electro-mechanically powered, palletizing systems can be either fully automatic or semi-automatic. Automatic palletizing systems consist of two main types: robotic palletizing systems and conveyorized palletizing systems. Robotic palletizing systems typically consist of a robotic palletizer stationed between a conveyor line of incoming product units and a pallet dispenser. A hydraulic robotic arm lifts cases, bottles, bags or drums using flat pincer arms or suction cup arms in organized rows onto a pallet, stacking units with near-perfect precision. 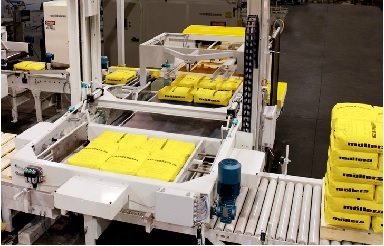 Robotic palletizing systems may be altered to work with different types of product units and are excellent for handling fragile or heavy product units, although they may be slower, as they can only place one unit or row at a time. Conveyorized palletizing systems can be either automatic, requiring no manual involvement, or semi-automatic, requiring loads to be manually connected and disconnected from the palletizer lifting arm. In conveyorized palletizing systems the packaged units are received by roller conveyors and are continuously transferred and sorted to the pallets. There are two main types: low level and high level palletizing systems, both of which have a feed area that receives the goods that are to be palletized. In low level palletizing systems, or floor-entry palletizing systems, products are loaded from the ground level, while high level palletizers are loaded from above or from the story above. Palletizing Systems Palletizing systems are mechanized equipment that are used to load products onto palletizers. Because manual pallet loading can be time consuming and labor intensive, automatic palletizing as performed by palletizing systems is a money and time-saving process.